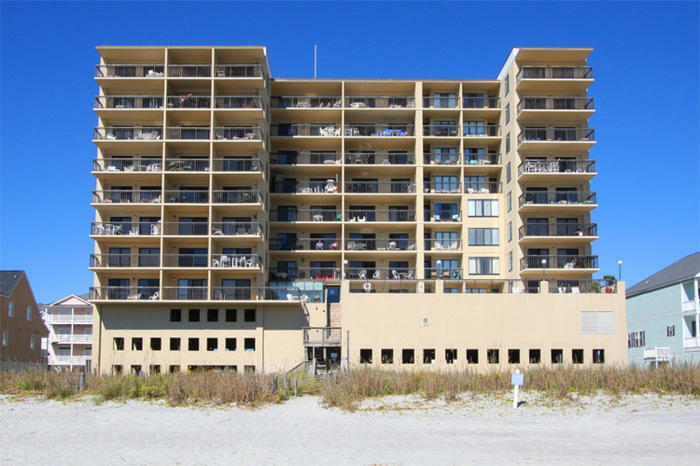 From the oceanfront balcony in each of these North Myrtle Beach vacation rentals you can see how to access the white sandy beaches. Just follow the sandy pathway through the dune line that is filled with sea oats and out to the beachfront. At low tide the beaches are wide and encourage you to run like a kid. You can generally wade out to the sand bar at low tide and shuffle your feet on the ocean floor as you search for sand dollars. When the tides come in and gets higher and higher, the waves get bigger and bigger. Try surfing these waves during your North Myrtle Beach vacation at Buena Vista. Or at least have an oceanfront picnic while you watch others go surfing in the Atlantic Ocean. Buena Vista is in a wonderful section of North Myrtle Beach, South Carolina. Cherry Grove is particularly unique because of the salt marsh and the inlet that comes up the west side of this neighborhood. Cherry Grove is a bit of a peninsula as it reaches north to the inlet, is adjacent to the ocean on the east and just a few blocks west is the salt marsh. Highway 9/Sea Mountain Highway is the southernmost roadway into Cherry Grove. Get back out to Highway 17 and everything is right there: shopping, dining, amusements, live entertainment theatres and more. Along the oceanfront and on the Intracoastal Waterway, which is just a short drive from Buena Vista North Myrtle Beach Resort are fishing opportunities on piers, charters and boat rentals, in addition to water sports such as parasailing, Sea Doo rentals and banana boat rides. Nearby shopping includes a couple of outlet malls that are a bargain hunter’s paradise. Restaurant Row is down Highway 17 and it features seafood buffets, steakhouses, sushi bars, burger joints and the nationally-known favorites like House of Blues. The amusements found throughout North Myrtle Beach and Myrtle Beach are everything from Ripley’s Aquarium and the Myrtle Beach SkyWheel to miniature golf courses and amusement rides. Water parks feature fast water slides and lazy rivers while Family Kingdom Amusement Park is across the street from the beach and boasts a roller coaster and a wide variety of rides for everyone in the family. The Myrtle Beach area is famous for its live entertainment theatres. The talent that comes onstage in the North Myrtle Beach area is terrific. Guest artists and your favorite bands hit the stage throughout the year and resident shows at family-favorite theatres change annually with special performances at the holidays. Get your tickets for the singing sensations at the Carolina Opry and enjoy the music at the Alabama Theatre. Roll dinner and a show up into one attraction and you end up with Medieval Times and Pirates Voyage where you are served a four-course feast while watching swashbuckling pirates or jousting knights. It is fun for the whole family. When you are in North Myrtle Beach for a memorable vacation and you choose Buena Vista you are well on your way to creating lasting impressions on your family. Buena Vista offers nice accommodations in a fantastic location.